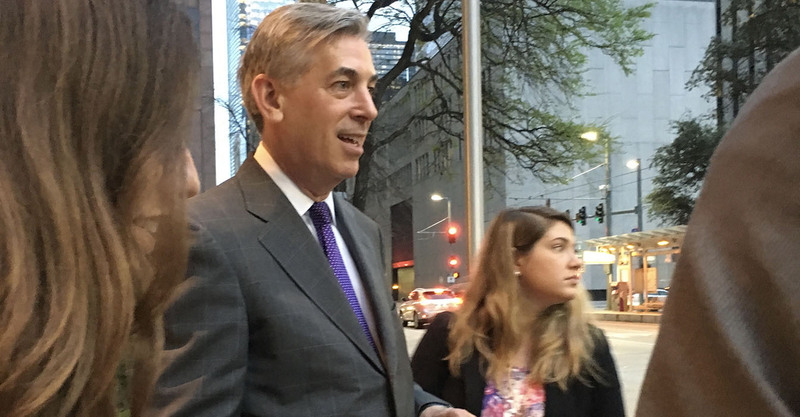 Susman Godfrey partner Neal Manne outside Houston federal court. Releases of wrongly held arrestees were set to begin this week, as Rosenthal on May 11 denied the county’s request for more time. She ordered that release of all eligible indigent misdemeanor defendants commence on personal bonds and affordable bail within 24 hours of their arrest. However, late Friday, the 5th U.S. Circuit Court of Appeals granted the county’s request to halt the order so it could review the case, despite 80 arrestees who were already being prepared for release. Throughout the litigation, Harris County defenders have suggested many of those incarcerated want to stay in jail – especially if it’s cold. Rosenthal turned that argument around in denying relief from her injunction – saying if truly only a small handful of people are wrongly held, the county cannot show it will suffer irreparable harm. Neal Manne of Susman Godfrey represented the indigent plaintiffs pro bono in the first trial challenging the practice of denying meaningful bail to low-risk poor arrestees. The attack on bail systems has been led by the Washington, D.C., public interest group Civil Rights Corps and its founder, Alec Karakatsanis, and was also supported by the Texas Fair Defense Project. Susman partner Alexandra White also served as counsel in the trial of O’Donnell v. Harris County, which took eight days in which 300 written exhibits, 2,300 video recordings of bail hearings and 13 witnesses were presented. Harris County has spent more than $2 million defending its write to hold poor, low-risk arrestees. The decision has focused national attention on the nationwide practice of jailing poor people because they are unable to afford bail when arrested for minor offenses. Karakatsanis and the Civil Rights Corps have won settlements in smaller jurisdictions and are planning lawsuits in other large counties.